I had seen Capitol Building in many Indian both Bollywood i.e Hindi movies and Tollywood i.e Telugu movies. The funny part is during my childhood, I mistook Capitol Building to be White House. 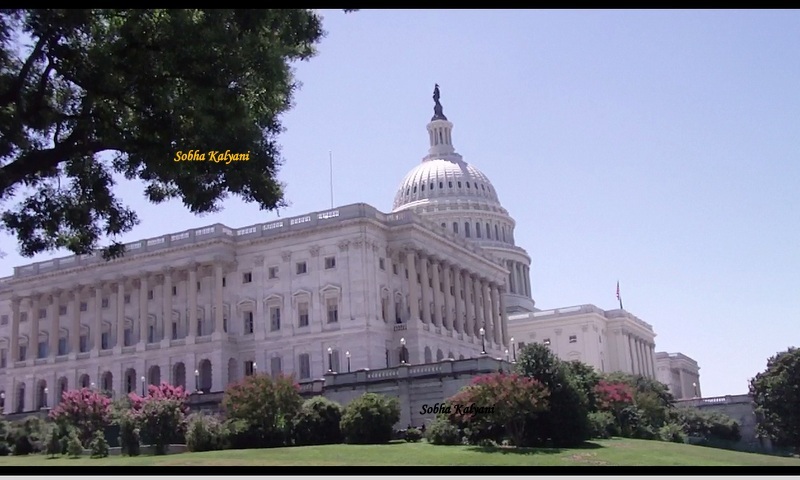 Well, later I came to know that U.S Capitol Building in Washington D.C (District of Columbia) is like our Parliament i.e the center / working office of American govt. This is also one of the top tourist attractions of the U.S. The world famous domed Capitol building crowned with a bronze Statue of Freedom, is the house of the U.S House of Representatives and Senate. Well, during our stay in Chicago, IL we took a round about trip in Amtrak train from Chicago. The train journey was quite enjoyable. It was during summer and we planned to see the American Independence Parade on July 4th. As that was a pre-planned trip, my husband managed to get the passes for guided tour in the Capitol Building. You can also get same-day tour pass at the Information Desk in the lower level of the Visitor Center. During peak seasons you may not get the same-day pass. The Visitor Center is the main entrance of the Capitol Building and is located beneath the East Front Plaza at First Street and East Capitol Street. The center is open to visitors from 8.30 a.m to 4.30 p.m - Monday through Saturday. It remains closed on Thanksgiving Day, Christmas Day, New Year's Day and Inauguration Day. Guided tours are free and are taken from Monday through Saturday between 9 a.m to 3.20 p.m. The guided tour begins with 15-minute film / video introduction named 'Out of many, One' in one of the Orientation theaters. This is quite informative as you get to know about American War of Independence and the country's struggle to establish democracy and construction of the Capitol Building. On entering inside the building, you will see the Crypt, the Rotunda and National Statuary Hall. The tour begins at the Visitor's Center and ends at the same place. You will be awed to see the majestic life-size statues that reflect the American history. The group of visitors are given headphones so that you can easily hear your guide's instructions. Once you are with your group / guide, you need follow the instructions of your guide and go in lines through the security. You have to go down the Visitor's Center on the back side and then get down the stairs. You can follow the directions at every place. The guide keeps narrating and it's great to listen / learn about American history. As you keep listening to your guide and walk all along, you will be amazed to see the beauty of the ceiling of the dome. You can see visitors lifting up their heads and taking clicks of the wonderful dome. The gorgeously designed ceilings and the stunning architecture are simply superb. In spite of lots of walking inside and outside Capitol, it's worth a visit. Visitors are not allowed to take in certain items inside the building. The include water / liquids, food / beverages / fruits, aerosol containers, non-aerosol spray (sprays for medical needs are allowed), sharp and pointed objects, stun guns / guns / martial arts weapons, fireworks, large bags and pepper spray. Before or after going inside the building, you need to walk long ways looking at the beautiful buildings, monuments, memorials like Lincoln Memorial, beautiful cherry blossoms etc. A tour in and around Capitol Building is quite interesting and worth a visit. Take time to enjoy the outside greenery and garden and the interesting structures. Summer is terrible in Washington D.C and the scorching heat reminds you of the summer in India. And the long walks in and around the building is tiresome and makes you exhausted.